Which antioxidants will help me live longer? Are there natural remedies for my sleepless nights? How do I cope with issues beyond my control? At the end of our days, we all want to have lived a happy, healthy life and made a difference. 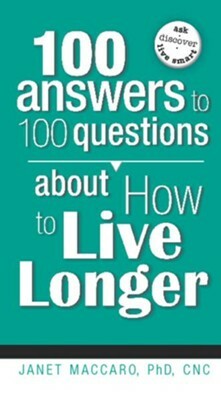 100 Answers to 100 Questions about How to Live Longer will show you how. Janet Maccaro, PhD, CNC, is a respected lecturer, author, and radio/television personality. She has doctorates in nutrition and natural healing and is also a leading expert in natural progesterone supplementation. Internationally recognized for her knowledge in womens health, Janet Maccaro has written books that include Fabulous at 50, A Womans Body Balanced by Nature, The 90-Day Immune System Makeover, Breaking the Grip of Dangerous Emotions, Midlife Meltdown,and Natural Health Remedies. I'm the author/artist and I want to review 100 Answers to 100 Questions about How To Live Longer - eBook.